Restoration Yard doesn’t just refer to our renovating and renewing the lovely old buildings here – we passionately believe in restoration of self too. Life is complicated enough: so we’ve created a haven for emotional healing, rebalancing and renewing the self. We call it our Wellbeing Lab: a welcoming series of spaces for everything from yoga and Pilates to mindfulness and parent & babies classes. We host learning workshops and art-making crafternoons, and also offer Harmonizing coaching, massage, reflexology and Cognitive Behavioural Therapy in our Sanctuary. Just click on our What’s On Listing here to browse classes and courses. You can also read more about our teachers here. Restoration Yard is a community hub where ideas around wellness of spirit, mind and body can be shared. Here we can breathe, move, bring our focus back to the present moment and accept what we cannot change. As well as our larger space, we’ve also The Sanctuary, a new therapy room in the Laundry House Building for one on one therapies such as Harmonising Coaching, CBT and massage. All our studios here can also be booked as inspiring, flexible venues for workshops, seminars, launches, community and corporate events. And with Restoration Café and the Foodhall Coffee Bar close to hand, your event can be catered for in every way. 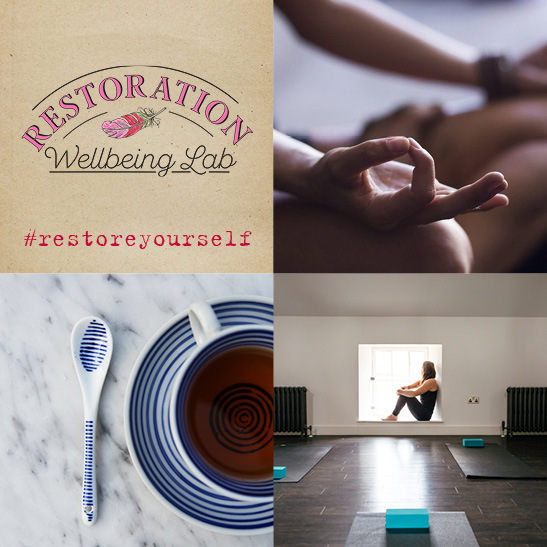 For further information on classes, hiring or booking, please get in touch with Jen Wood, Therapist & our Wellbeing Lab Manager at jen@restorationyard.com or sign-up here for our newsletter with all the latest news, events and promos. And check What’s On for a day by day activity listing.